Demi Lovato has been traveling across the country on her Tell Me You Love Me Tour picking up GALA Choruses and other LGBTQ+ choruses along the way to offer them a chance to sing on stage with her. Many Chorus Connection customers were lucky enough to meet Demi this year and today we focus on the story of the Major Minors, the 12-member youth chorus of Nashville in Harmony. 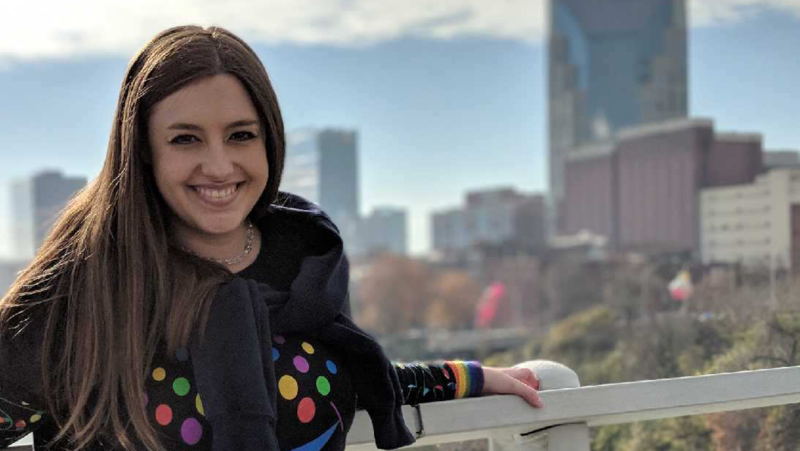 We caught up with Nashville in Harmony's Outreach Director, Lily Ferguson, to learn more about their experience working with Demi. Hi, Lily! Thanks so much for sharing this story with us. Why don't you tell our readers a little bit of information first about Nashville in Harmony and the Major Minors? 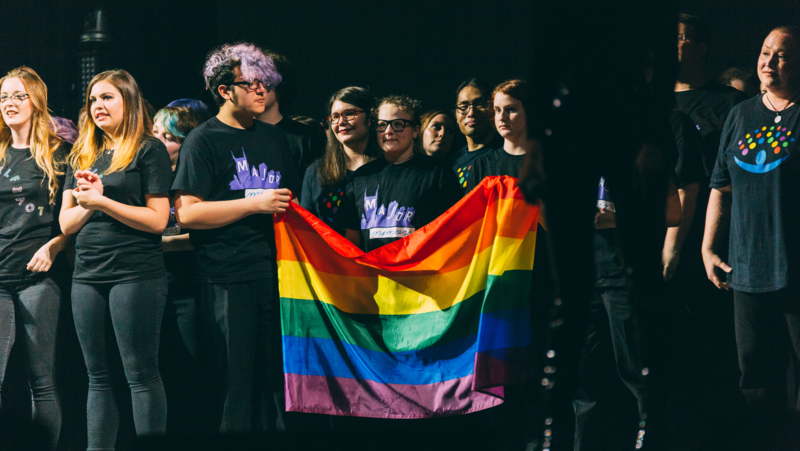 Lily: Nashville in Harmony and Major Minors are our two choruses in Middle Tennessee for people of any sexual orientation, gender identity, gender expression, and allies. The mission of Nashville in Harmony is to use music to build community and create social change. 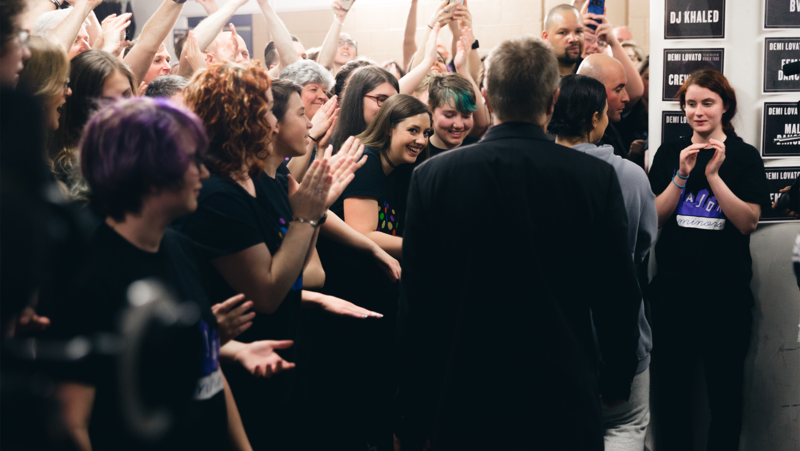 The chorus was founded 15 years ago as a way to bring the LGBTQIA+ community and the ally community together in a city where highest musical excellence is the standard. We also have a "5th Section", which is what we call our group of non-singing volunteers, bringing our total number of members to around 150/175. We provide opportunities for anyone who wants to serve our mission, whether the person likes to sing or not. The community we build brings together people with many talents and open hearts. Sounds like a great community! Can you tell us a little more about the Major Minors chorus specifically? Lily: The Major Minors is a group for young people, ages 12-18, to be themselves without apology. Its mission is to use music to build community and create social change. The chorus is a safe, welcoming, and accessible place for all youth that celebrates the joy, diversity, strength, and pride of today’s young people. Members of the Major Minors find their own voice and unique identity within a welcoming community. 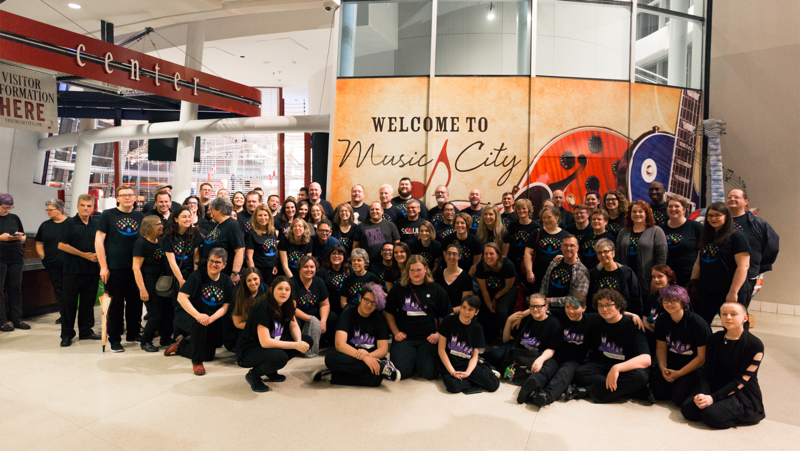 Some members and parents of the Major Minors have been a part of the Nashville in Harmony family for years previously, but the chorus was officially established just a year ago (2017) and we have 12 members to date. Wow, only one year in and the group got to sing with Demi! I've been singing my whole life, can I meet her? Just kidding... kind of. So, why do you think Demi has been specifically asking GALA Choruses to join her on tour? Lily: The Tell Me You Love Me Tour included CAST Centers, Demi's co-owned mental health program, to provide free therapy sessions and wellness workshops. CAST's representatives explained to us that it was their mission to empower every individual with self care. 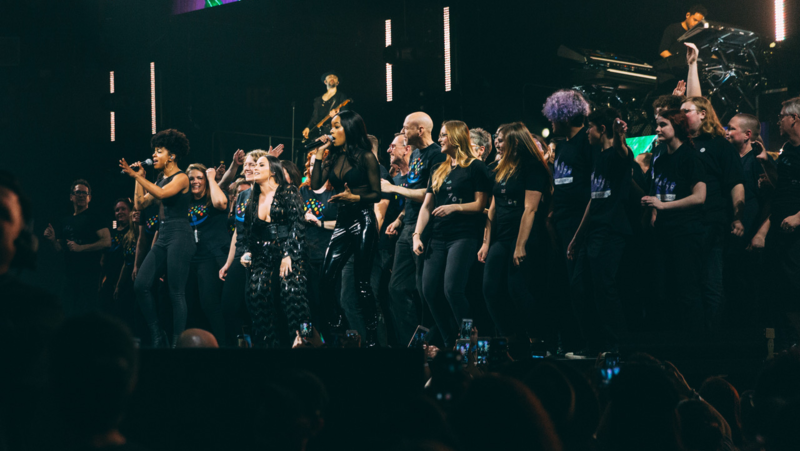 It was my impression that asking GALA choruses to join in that mission shows that Demi's tour wanted to include people who represent marginalized groups on stage with her to make a statement. The fact that Demi has demonstrated a lot of activist work for the queer community and personally identifies as part of the queer community shows that she has chosen to use her platform to elevate others, to see themselves as not just represented, but also see themselves celebrated by others when they are often not. Demi is openly bisexual, a mental health advocate, and a very talented pop star. She has been very open in recent years about struggling with symptoms of bipolar disorder, addictions, eating disorders, and self-harm. She has also been very active in advocating for the LGBTQ+ community. She's received a number of awards and honors, including the GLAAD Vanguard Award, and continues to serve as a strong LGBTQ+ leader and activist. Last year Demi was named by Global Citizen as the organization's official ambassador for mental health, with a special focus on vulnerable communities around the world. Our singers felt an extreme joy to be included in the performance. We're happy to have shared the same space as such powerful advocates, who reflect our mission and our community. I had no idea! Sounds like she is doing some amazing work for the LGBTQ+ community. So how did this whole opportunity come about? I remember you saying you had something like 48 hours to plan?! Lily: We received an email through our website Monday, March 26th at about 10 AM from the tour manager for the Tell Me You Love Me Tour. We organized 91 members to participate in the show that Wednesday night, March 28th, 2018. Holy cow! How'd you make that happen so quickly? Lily: I used Chorus Connection's listserve to organize by mass email. It was an essential way to get the information out. We even had a small group of members attend sound check earlier Wednesday to learn the protocol so that they could teach it to the larger group later that night. 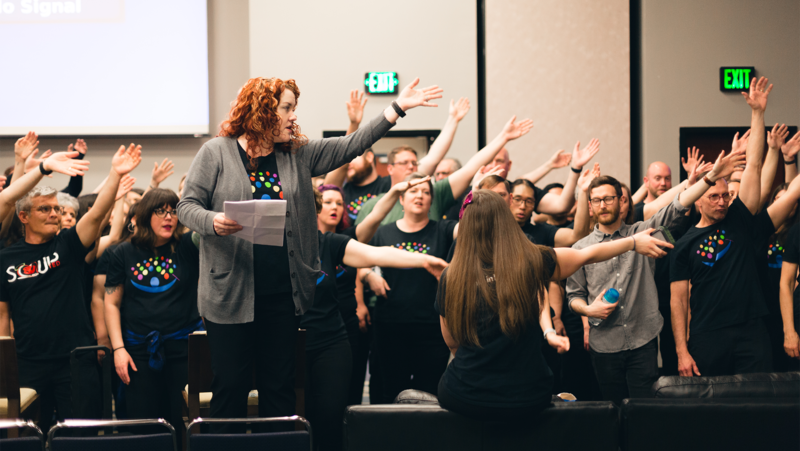 Because of Chorus Connection, we were able to update members with instructions, sheet music, and song files as soon as details were being finalized. Yay, that makes us so happy! We're glad that we could help make that process much easier for you. Tell us a little bit about the concert experience. What songs did you sing? How many people were in the audience? Lily: The concert took place at Bridgestone Arena in Nashville, TN on March 28, 2018, 8pm. There were over 15,000 people in the audience! We sang on the last two songs, "Sorry Not Sorry" and "Tell Me You Love Me." They allowed us to wear our Nashville in Harmony t-shirts, which felt like a great opportunity because of the support from Demi and her tour. In addition, we were given t-shirts from CAST Centers that say "Self Love" in rainbow letters. I love that! Did the singers get to meet Demi? Lily: We were included with her tour team as Demi walked down the hallway to get to her dressing room. We got priceless photos of that. The entire experience was a thrill for our Major Minors. So jealous. What are your singers and/or parents saying about the experience? And why do you feel it was so important for the Major Minors to have this experience? "What an awesome night to be in Nashville! Being on Demi Lovato’s stage with you all last night was an incredible, surreal experience. Seeing the joy and awe in your faces and the faces of the Major Minors was so special. I’m continually amazed and humbled and grateful for the community we have and continue to build together." "Hey, that concert was a real blast, wasn’t it?!" "It was really so special." "As a parent, I thought it was terrifying and exuberating all at the same time. To see the joy on my child’s face and to know they were able to be the best version of [themselves] with no judgment, just pure joy! " We even had a parent write an article about the experience on Out and About in Nashville. As our Membership Director, Beth Thorneycroft, put it, "The theme of self love that Demi and the tour cast spoke about reflects the message we envisioned for our own show this season. This was particularly important for the Major Minors, many of whom still suffer the effects of school bullying on a daily basis." What an incredible experience for your group. What's next up for your performances? Lily: Our next concert is "Makin' Spirits Bright!" on Tuesday, December 4, 2018, 7pm at Langford Auditorium, Vanderbilt University. Thank you so much to Lily Ferguson, Beth Thorneycroft, Nashville in Harmony, and, of course, Major Minors for this interview! Lily Ferguson serves on the executive board for Nashville in Harmony as the Outreach Director. Their mission is to use music to build community and create social change. 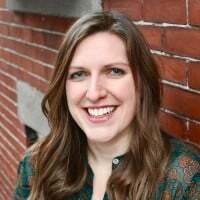 As Outreach Director, Lily brings that mission to spaces beyond the chorus, planning and organizing singing events that aren't their main stage shows. She has been singing Soprano I with Nashville in Harmony for three years and serves as section leader for Major Minors as needed.